Lately, I’ve been making these super organized, really thought out grocery lists to try and maximize our meals. For me, this means two main things: 1) Focusing on fresh ingredients that really get me excited about cooking and 2) Making sure I develop meals around our schedules so that it’s not as appealing to just order take-out several nights a week. As a result, I’ve been gathering easy ingredients to always have on-hand for quick, satisfying meals – hey there, easy breakfast-for-dinner nights! – and making sure I have a veggie & noodle salad of some kind, or an easy soup, in the fridge and ready to go when hunger pangs come calling. 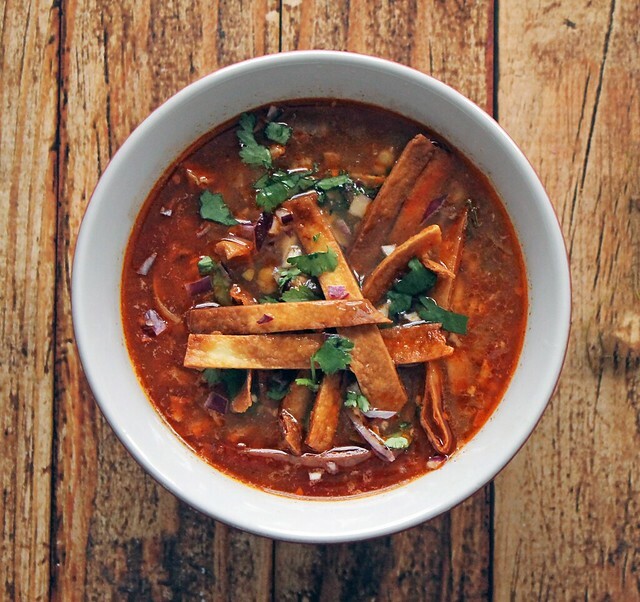 This chicken tortilla soup is one of my absolute favorite soups, first and foremost, because it is just so tasty. Every time I make it, I exclaim that we should eat it once a week and that is so not an exaggeration – it’s really that good. 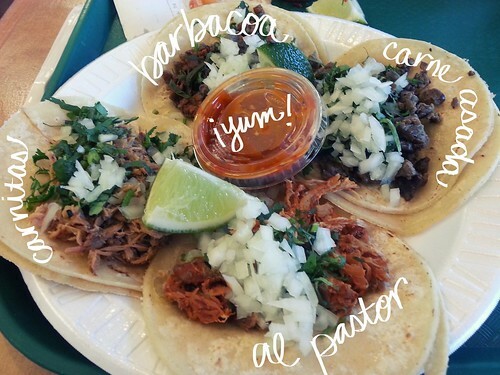 Plus, it fits my new maximization mantra of having fresh ingredients and flavors, while being a fairly adaptable meal for different schedules and levels of attention. While the recipe first came into my life as an option for the slow cooker, I found myself this week with all the makings, but without having had the forethought to put it together in the morning. Fail face. Sure, I could have waited for the next day, but this soup is so good that it possesses my brain every time I get ready to make it so that there’s this constant thought loop of “Is it chicken tortilla soup time yet?” After a bit of adaptation and messing about, it was chicken tortilla soup time and only within about 75 minutes for prep & cooking combined! Which means that this delicious, satisfying, feel-so-good soup is now even easier and faster to get from fridge, to pot, to bowl, to face. And that’s something I fully support. Yields 4-6 servings; adapted from here. In a heavy-bottom pot, drizzle in enough vegetable oil to cover the surface and apply medium-high heat. Generously season both sides of the chicken breasts with salt and pepper. When the oil begins to ripple, add the chicken breasts to the pot skin-side down. Allow to cook for 5 minutes or until they have developed a brown crust. Flip chicken breasts and cook on other side for another 5 minutes. Remove chicken breasts from the pan and set aside. Reduce heat to medium and add onion and garlic, sauteeing for 4-5 minutes until the onions begin to turn translucent. Season with salt and pepper and add bay leaf, cumin, and chili powder. Stir to combine and allow spices to toast for 3 minutes with the onions and garlic. Turn heat back up to medium high and slowly stir in the chicken stock, releasing any brown bits from the bottom of the pot with your spoon as you pour. Add the tomatoes, green chile peppers, and enchilada sauce and stir together. Add chicken breasts to pot and any juices that have collected while it was resting. Cover pot allowing only a tiny vent for steam and bring to a low boil. Adjust temperature accordingly and allow to simmer like this for 30 minutes. Reduce heat to medium and cook until the chicken is no longer pink in the center, approximately 15 minutes more. Remove soup lid and add corn. When chicken is done, remove from pot and rest until it is cool enough to handle. Allow the soup to continue cooking, uncovered, on medium heat so that it reduces some. In the meantime, you can prep the red onion, cilantro, limes, and tortilla strips for the garnish. In a small-to-medium deep pot, pour in about 1-inch of vegetable oil and apply medium-high heat. In the meantime, slice your flour tortillas in half and then slice them across into a series of 1/4-inch, thin strips. 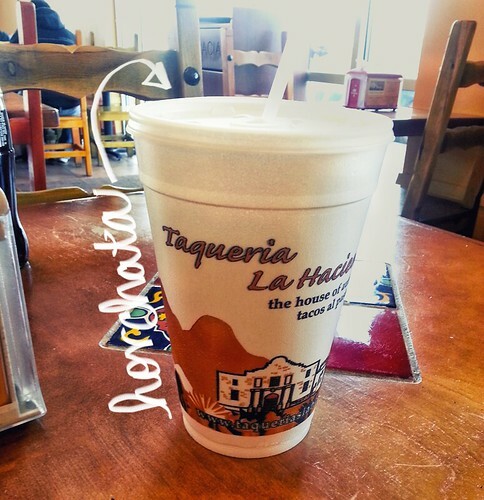 Test the oil by putting the end of one of the tortillas into the oil and see if it sizzles. If so, drop one in and test it. You want it to achieve golden brownness in about 15 seconds. If it doesn’t get there, discard strip and let oil heat up a bit more. If it gets dark much faster, lower the temperature of the oil accordingly. When ready, add a small handful of the strips at a time and, watching them carefully, gently move them around the hot oil with tongs as they turn golden and crisp up. As you remove the strips from the oil, drain them on paper towels and salt them lightly while they’re still hot and fresh. Finish the remaining strips and set aside. Pull the chicken off the bones and discard them along with the skin. Shred the chicken meat and add back to soup. Allow to warm and re-incorporate for about 5-7 minutes. Turn soup off and cover until ready to serve. 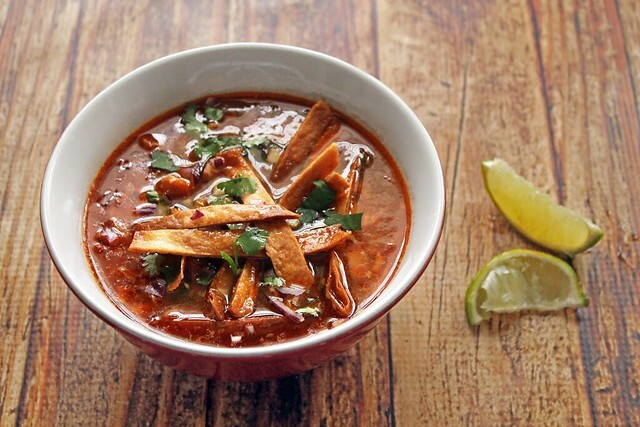 When ready to eat, ladle soup into bowls and top with diced red onion, cilantro, a squeeze of lime juice, and fresh tortilla strips. Well, it’s true. Femme Fraîche went on an 8 month hiatus, but I’m back and so excited to be! Readers, the past few months have been a total trip and if you heard about all of it, you’d understand why I was gone for so long. I’ll spare you the more involved details, but leave you with these two major culprits: 1) My gorgeous and expensive camera broke and the $250 price tag to fix it didn’t fall under “immediate need” and 2) We had a bit of remodeling work done on the homestead that completely overtook the summer and early fall. It wasn’t a pretty time here. The kitchen was torn out and unusable for weeks. Bear and I spent more time at Sonic and in Ikea than at home where we were often confined to living in one room while the others were under various forms of demolition. At one point, the only accessible water we had for drinking had to come out of the spout for the tub. Bleak. The good news is that all of this is behind us, though I did totally have a nightmare about our contractor just two nights ago, so the trauma is REAL. That being said, I’m presently writing you from an updated home where the kitchen has a whole 3ft. of new counter space (up from barely 1ft. Yea, city living! ), a tiny dishwasher, and cabinetry like it, quite literally, never had before. 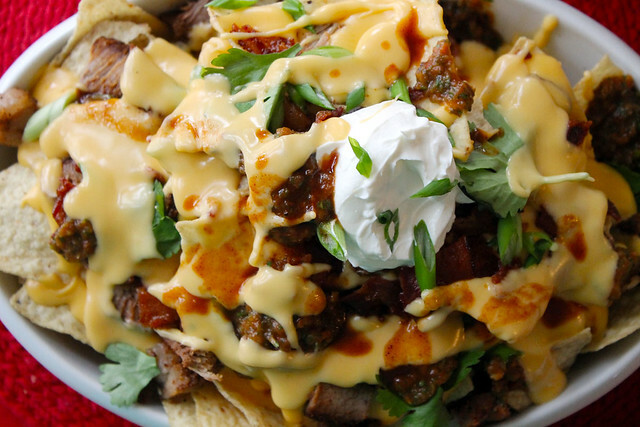 Just the perfect space to stage a comeback with these Macho Nachos that get their close-up courtesy of Santa and the new camera he brought me for Christmas. These are perfect for a winter movie night or for the upcoming Super Bowl and satisfy so many different cravings. Let’s get to gettin’, shall we? Is your first question after viewing this photo “what makes these nachos so macho?” or is it “can I please dive into that and hollow out a home?” The answer to the latter is “Yes, of course you can, weirdo,” and in terms of how these nachos get their moxy, well, let’s just consider their composition. That cheese sauce? It’s a BEER CHEESE SAUCE. You know, like the kind you’d dip soft pretzels into? Yes! It’s smooth and creamy and spiked with just the right amount of ale to make it have that slightly bitter taste that offsets all of the cheese. Studded amidst that boozy golden river of cheese are big, crispy pieces of bacon and slices of a spice-rubbed, grilled sirloin steak. I did say “macho,” friends! 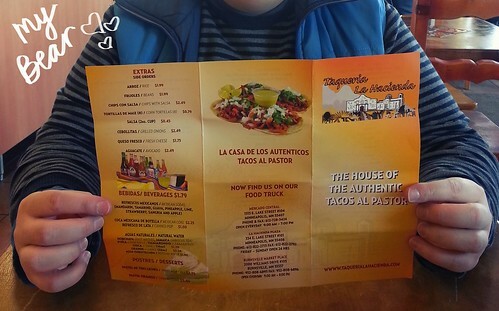 But it’s not just salty, delicious meats and cheeses that make these nachos so macho, you know… It’s big flavors! So on top of all this unctuous goodness is a homemade, charred tomato and pepper salsa that cuts through all of that indulgence with some really bright, fresh taste courtesy of an entire fistful of cilantro, green onions, and jalapeños. This salsa on its own is worth a spot on your Pinterest recipe board for when you want something impressive, but that takes only the effort of pressing the pulse button on your food processor a few times. 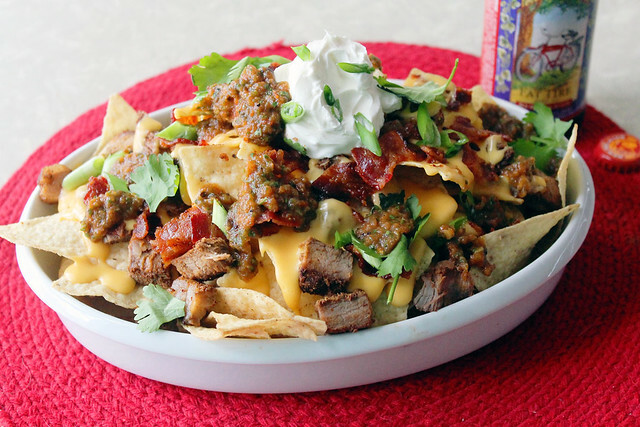 In fact, many of the elements on this plate of macho nachos can be made individually to just as many rave reviews as the completed dish. And, let’s just be honest, that nacho beer cheese sauce is going to be good on pretty much anything you put in, or near, your mouth. Preheat oven to 450° F. De-pulp/seed/vein tomatoes, peppers, and onion and add to large bowl. Add peeled and chopped garlic cloves. Drizzle with 2-3Tablespoons of olive oil, toss, and sprinkle with salt before tossing again. 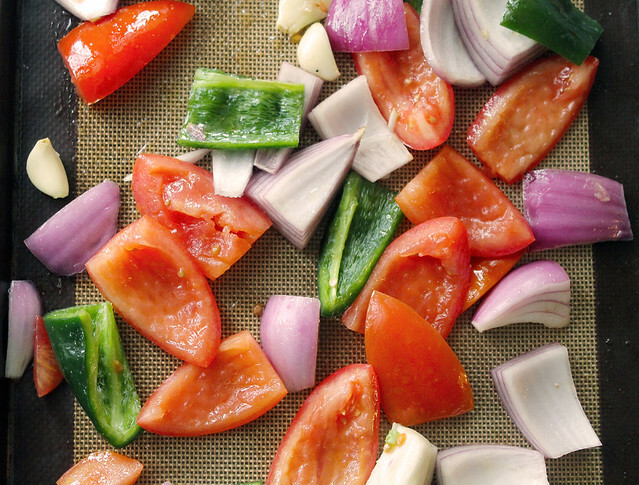 Arrange vegetables on a large baking sheet in a single layer. Bake for 25-35 minutes or until edges are very dark brown and lightly charred. Remove from oven and then add to food processor with reserved tomato pulp, canned tomatoes, cilantro, green onions, cumin, lime juice, and a few dashes of your favorite hot sauce. Pulse until desired texture is achieved. Store in an airtight container for 7-10 days. Melt the butter in a medium saucepan over medium heat. When it is liquified, whisk in the flour, forming a roux. Cook the roux, stirring occasionally, for 2-3 minutes. Slowly add 1 cup of the beer while whisking the mixture and allow to thicken slightly. Add both cheeses and half of the remaining beer. Allow to melt completely and season with salt and hot sauce to taste. Remaining 2oz. (and remainder of 6-pack) of beer go to the chef! Rinse meat, pat dry, and allow to come to room temperature. Meanwhile, combine spices into a rub. Drizzle meet with olive oil on both sides and then rub spice mixture into meat on both sides and all edges. Heat a grill or grill pan on high with 1 Tablespoon of canola oil and allow to get very hot; oil will ripple to indicate it’s ready. Add steak and cook for 5 minutes, allowing char lines to form. Flip steak and reduce heat to medium high and finish cooking for another 5-7 minutes depending on your desired doneness. When finished, removed meat from pan and allow to rest before slicing or cubing for nachos. You will need, the above elements, tortilla chips, sour cream, and additional chopped green onions, cilantro, jalapeños, & red onion. 1. 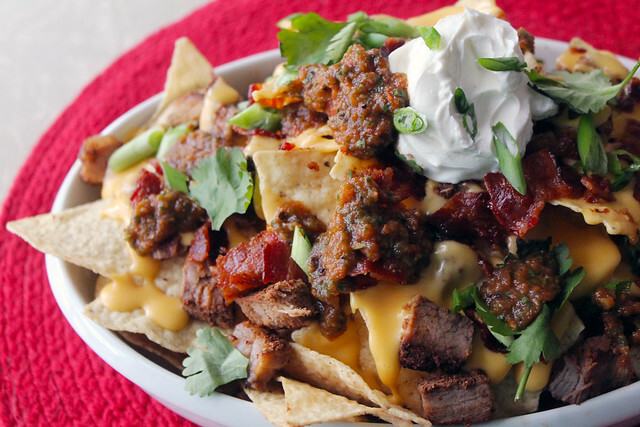 Prepare a mountain of your favorite tortilla chips. 2. Pour melted beer cheese sauce over the chips. Be generous. 3. Add ribbons of steak and bacon. Be further generous. 4. Add salsa over the chips to your liking. 5. Crown the pile with a hearty scoop of sour cream, if desired. 6. Sprinkle sliced green onions, cilantro, and diced jalapeños and/or red onion for flourish that your tongue and eyes can appreciate.